I took a printmaking class and, after the experience, I just knew that I had to have a printing press of my own. After much research, I decided that a platen press would work for me at home, and I started my shopping. The press I wanted was beautiful but it was expensive and the cost of shipping would double the price, so I made one. From a photograph in a catalog that I can no longer locate, I drafted plans to build. If I can find my original sketches, I will post them. I did not know about instructables at the time and failed to photograph the process so much of this instructable is based on photos of the finished project, explanations and diagrams. And while I rarely use my press, the reward of drafting plans and executing them give me great satisfaction and pride. Note: With hardwoods, generally, there is one finished side and one raw side. Make sure you work on a level surface. Step 2: General Order of Construction. Fabricate Bottle Jack Guide and Thread Rods. Glue Birch boards in pairs. Glue & bolt A & B boards in pairs. Connect C boards (Legs) to B assembly. Connect Bottom Platen to C-B board assembly. Attach Rods to complete major structure of the press. Step 3: STEP ONE: Fabricate the Bottle Jack Guide and Have the Rods Threaded. If you have the tools and welding skills, you can do this yourself. I went to a machine shop and had someone do it for me. Measure the diameter of the top of your bottle jack. Draw a sketch of the bottle jack guide or just use the photo and description. Take the photo/description of the guide, one of the nuts you will use with the rods, and the rods themselves to a machine shop. Have the shop thread the ends of your rods to 7 inches from each end. Show them the nut you will be using to make sure the nut will fit the threads. Have them fabricate the bottle jack guide. While you wait for them to call you to pick up, move on to STEP TWO. Measure twice, Cut once. Wear safety goggles. Use the table saw to cut four 18 inch by 22 inch the rectangles from the birch plywood. If you have a large piece of plywood, have someone help you as you push the plywood through. Set the boards together out of the way of your work space. Use the radial arm saw to cut the lengths. Again, if you have a long board, have someone help you support the board while you make your cut. Or, you can clamp the board to the saw table. Shape the maple boards. Refer to the drawings for assistance. Lay the board on its widest side. Mark the Center of the length on the edge furthest away from you. Measure and mark 5 inches from each side of Center. At each end of the board, measure and mark 3-1/2 inches from the edge closest to you. From each end, use a square to draw a line across the board, about 4 inches long, toward the center. Using a straightedge, connect the end of the line made in #5 to the mark made in #3. Turn the board over and repeat from #2 through #6. Use the band saw to cut along the lines you have drawn. Check to make sure the cuts went through the lines drawn on both sides of the board. Use this board as a template for the three other A Boards. Measure and mark 2 inches from each end cut. Use a square to draw a line across the board. On each end, from the other edge, measure and mark 2 inches. Use a square to draw a line to meet the first line. Turn the board over and repeat the steps on the other side. Use the band saw to cut two inch blocks from each side. Check to make sure the cuts went through the lines drawn on both sides of the board. Repeat for your second B Board. C Boards (3) These will be the "LEGS" of the press. Measure and mark 2 inches and 5 inches from each side of Center. At the 2 inch marks, using a square, measure and mark 2 inches down. Draw lines to connect the marks. On each end, from the other edge, measure and mark 3-1/2 inches. Using a straightedge, connect the 3-1/2 inch mark to the 5 inch mark. And connect the two 2 inch marks. Use the band saw to cut along the lines (SOLID lines in the diagram). Make many additional cuts between the two in from the center cuts. Chisel out the area between and make the inner corners square. Use this board as a template for the two other C Boards. Measure and mark 2 inches from each side of Center. Use the band saw to cut along the lines. Make additional cuts between the lines and chisel out the area. Make the inner corners square. Use this board as a template for the four other D Boards. On each end, from the other edge, measure and mark 3 inches. Use a straightedge to connect the marks. Use this board as a template for the five other E Boards. You will be working with Boards A and B of the maple and also the birch plywood. The A boards will form the Top and Center Bars, the B boards will be part of the Base, and the birch plywood will act as the plates of the Top and Bottom platens. Match and pair up the pieces. Align the edges of one pair. Place over concrete masonry units (cement blocks) and stabilize it while you drill and you don't drlll through the floor. OR use a drill press. Drill one hole in the center and two at least 3 inches from the ends. See diagram. Drill countersink holes on one side of one board. Realign the boards and put a lag bolt through each of the holes. You may have to use a hammer to tap the lag bolt through. Put a washer and nut on each of the threaded ends and using a socket wrench, tighten all of the nuts. The lag bolts will act as your clamp for these pieces. Use the Dremel to clean up the lag bolt counter sink holes. Repeat 2 - 12 for the other pairs of boards. Find the nicest, smoothest side of each piece. Mark an "X" on the other side. Spread glue on the X'd side of each piece. Align the boards in each pair, glued side to glued side. Step 11: STEP NINE: Drill Holes for Threaded Rods. The three sets of boards, A boards and the B boards, that were bolted together in Step Eight will be aligned vertically. One set of the A boards and the B boards will be secured to the threaded rods with washers and nuts. The other set of the A boards will be allowed to slide along the length the rod. Set B Boards on a level surface with the cut out side down. The lag bolts should be horizontal to the ground. Place one of set of A boards on top of the set of B Boards. The heads of the lag bolts of both sets of boards should be facing the same direction. Clamp the two sets of boards together very, very tightly. Using the power drill or drill press and a 1 inch drill bit, drill 1-1/2 inches (on center) from the end cut of the boards. Drill on the other side as well. See diagrams. Place the other set of A Boards on a level surface with the cut side down. Place the set of B Boards, cut side up on top of the set of A Boards. The heads of the lag bolts of both sets of boards should be facing the same direction. Using the holes in the B Boards as a guide, use the power drill and a 1 inch drill bit to drill holes for the rods through the second set of A Boards. Stack sets of boards one on top of the other with the set of B Boards at the bottom. Stick one rod through all three holes on one side of the stack. Stick the second rod through the holes on the other side of the stack. If the holes were not drilled accurately, the rods should not fit. In that case, see where the rod is hitting the boards and re-drill or use a Dremel or a round rasp to enlarge the holes until both rods can fit through all sets of boards. Remove the rods and separate the sets of boards. Initially work with the B boards at the bottom and the C boards on top. After the boards are fitted, they will be turned over and glued and weighted down. Place the B boards notch side up on a level surface. Mark the center of the top side and 1 inch from each side of the center. Place the C boards across the B boards with the C boards' notch side down. Put one C board in the center and one on each side, flush with each notch cut. See diagram. Check if the C boards sit flush on the B boards or if the lag bolt nuts on the B boards hit the C boards. If the nuts are hitting the C boards, mark where they are hitting, remove the C boards and with a Dremel, grind out a well area that the nuts can fit in. See diagram and photos. Once the C boards are sitting flush, mark the placement of the C boards on the B boards. Mix glue and apply to both the C board notches and the B boards where the placement marks are. See diagram. Place the C boards notch side up and fit the B board set over and across them. Align the placement marks and weight the B board set down. I was able to balance the concrete blocks on the B boards. Clamps will probably work too but I was on my own during this step and couldn't manipulate the clamps and wood before the glue set. Let the glue set and cure. Use one birch rectangle and the five D boards. Mark the birch for the placement of the D boards. Get one of your birch rectangles and decide which side is the smoothest and has the fewest flaws. Work on the other side. Mark 2-inches and 5 inches from both 18-inch (width) sides, and 10 inches from one side (5 marks total). Using a square, draw lines across the width at each mark (5 lines total). Place a D board on its 2 inch edge along each of the three lines drawn on the #4 marks. There should be 3 inches between each board. Trace the outside edges of the D boards while they are in place. Make sure the surface of the birch and the un-notched sides of the D boards are clean. Mix up some of the two part glue and apply to areas marked on the birch and on the un-notched edges of the D boards. Place the D boards. glue side down and align the boards withing the marked areas. Clamp each D board to the birch. Make sure they do not become misaligned. Wipe off any excess glue. Set aside until the glue has cured. Step 14: STEP TWELVE: Attach Bottom Platen to Base Assembly. Lay a couple of pieces of cardboard or blanket on a level surface as a cushion and to prevent scratches on your wood. place the Bottom Platen assembly, flat side down, on the cushioned surface. Turn the Base, legs up, and fit it to the Bottom Platen Assembly. Sand down any tight areas that prevent the Platen assembly and the Base from fitting smoothly together. The outer B boards of the Base should be flush with the C Boards of the Bottom Platen. Trace the outline of the C Boards onto the B Boards. Separate the Base from the Bottom Platen. Mix your glue and apply to the notched sections of the C boards and the marked areas of the Base boards and set in place. Place a board across the legs on the Base and weight down or clamp together. Turn one A board assembly cut side down. Measure 3 inches from each end. Using a square, draw a line across the width. Hold a pad eye centered over each of the lines and mark the screw hole locations. Drill pilot holes at the marks. Center the bottle jack guide in the center of the A board assemblies and mark screw hole locations. Drill pilot holes at the marks and screw in the bottle jack guide to the Top Bar. With a Swivel in the humped area of the Pad Eye, screw the Pad Eyes in place. See photograph. With the long side down and cut side up, measure 3 inches from each end. With a Snap Hook in the humped area of the Pad Eye, screw the Pad Eyes in place. See photograph. Step 16: STEP FOURTEEN: Put the Press Together. On one of the threaded ends of the rods, screw a nut on as far as it will go. Don't strip the threads. Lay a washer over the rod hole on the Base/Bottom Platen assembly. Slip the threaded end of the rod, with the nut, through the washer and rod hole. From the bottom, put a washer over the threaded end and screw a nut on until the nut is tight. Repeat 1-4 for the other rod and the other side of the Base/Bottom Platen assembly. Maneuver the Center Bar so that the rod holes fit over the rods that have been attached to the Base/Bottom Platen assembly and guide it to rest on the plate side of the Bottom Platen. On the top of the rods, screw a nut on as far as it will go. Don't strip the threads. Slip a washer over the nut. Maneuver the Top Bar so that the rod holes fit over the rods and let it rest on the washer and nut that were put on in #7 & #8. Check to see that the Top Bar is level. 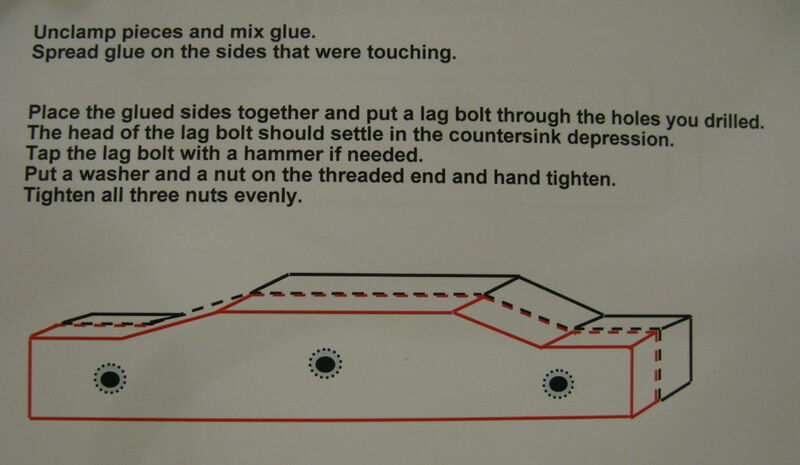 If it is not, adjust the nuts that were placed in #7 until the Top Bar is level. Place washers over the rods so that they rest on the top of the Top Bar. Screw nuts on the rods so they hold the Top Bar in place and level. Evenly lift the Center Bar up the rods and attach the Snap Hooks to the Swivels to hold the Center Bar elevated. Use one birch rectangle and the E boards. You will use the Press and Bottle Jack as a clamp to hold the E boards in place as the glue sets. Mark 1-inch, 4-1/4 inch, 8-1/2 inches from from both18-inch (width) sides. Using a square, draw a lines across the width. You should have 6 lines. Line up the E Boards along the lines so there is 3-1/4 inches between each board. Make sure the surface of the birch and the E boards are clean. Rest the birch on the Bottom Platen plate and align the edges. Mix up some of the two part glue and apply to areas marked on the birch and on the long side of the E boards. Place the E boards. glue side down and align the boards within the marked areas. Carefully unhook the Center Bar and rest it on the E boards. Make sure the E boards do not become misaligned. Tap them in place if they do. Place the Bottle Jack on the center of the Center Bar and align the top of the jack with the Bottle Jack Guide on the underside of the Top Bar. Pump the Jack so that the Center Bar is pressed against the E Boards on the Top Platen. Step 18: STEP SIXTEEN: How to Use the Press. I engraved a copper plate to demonstrate the press. It is my lack of engraving skills and my messy printing that is flawed, not the press. The Center Bar should be elevated and held in place with the Snap Hooks/Swivels. Remove the Top Platen and set it aside. Lay a piece of paper over the Bottom Platen to protect it from the ink. Lay the inked etched plate face side up on top of the paper. Lay printing paper over the plate. Lay another piece of paper over the printing paper. Lay a thick printing blanket on the top. Place the Top Platen over the printing layers. Unhook the Center Bar and rest it on the Top Platen. Pump the Jack up as far as you can get it to go. Use a pliers to release the hydraulic pressure of the jack. Lift the jack from the bottom and press it up into the jack guide to get the jack post back into the jack and so you can remove it. Lift the Top Platen off the press. Undo the printing layers. Be careful not to get any ink on the printing blanket. Lift your print and allow to dry. Can you share strength calculations? I'm about to make an inlay press and i made calculations for beech wood. I need a lot more material for only 1,5 tons press force than how much maple you are using for 6 tons. Awesome works.. Did you ever try this for commercial use? Hi! Thanks for your comment! I can't use the design commercially. The original design belongs to someone else. Well done but as a retired letterpress printer I can assure you even with 6 tons pressure over that area you will not achieve a good impression. Try dampening the paper it will make printing easier. You'll need a pin system or a frisket to get some form of registration. Good luck there are no original wooden presses around. really an excellent job! I would like to see an engraving wood remains. I do woodcuts why I say. I think quedaria different. I find it most interesting that your project roll press used to print engraving. A very detailed instuctable, but made more complicated than needed. Essentially you are making a Hydraulic press. Making it as one and then adding the larger press platen would be simpler and you now have a multipurpose tool. Not to distract from a great instuctable, just another method. Thanks, but now I have to look up to see what a hydraulic press is! Thanks for taking the time to comment. Always more to learn! and more and more and more! Are there any videos of this printing press being used? I'd like to see it in action before I try building it for a school. Thank you to whoever can help! No videos but if I get around to it, I will post it. thanks! 1. How much did it cost, approximately? 2. Do you think you could use it for finely etched copper plates (the traditional intaglio printing process)? It doesn't look like it would work, but the pressure sounds like it might be enough..... thoughts? Hi! It cost about $300. I think I was lucky to get the stainless steel hardware fairly inexpensively (at least that is what I remember). There was a huge store that carried marine supplies galore and priced really low. In theory, it should do fine with intaglio, but I am not sure that the pressure across the platen is even enough. Perhaps if, after the first press, you rotated your printing sandwich, and then again and again, it would turn out. Can't be sure. Thanks! That's super-helpful. $300 is pretty cheap for this type of thing, even if you got the materials inexpensively... But I think I might be able to get a teensy etching press for like $400. Hmm... I'll weigh my options and perhaps beg for a Christmas present? This could also be used as a paper press or book press. Nice job! Great job on that press. Say, has anyone made a movable type printing press? Router sign cutter would go good with this press. I had a 3x5 Kelsey letter press when I was in grade school. Grad 1955. Now have my own machine and injection molding shop. Your press is extra awesome. Old Printer. When I retire (ha! ), I would like to learn how to weld. A nicely documented piece of work. Do you really need 6Tones of pressure though? That said, I can see this design being adaptable to other purposes how is the wood holding up against this use? Thanks! Good questions! I wasn't sure myself about the weight capacity, but the press in the catalog called for a 6 ton jack, so that is what I got for Mothers Day! When pressing, I lift the jack as far as I can, using my full weight and strength and I am not a tiny person (I'm not that big either). I'm sure I'm not using the full 6 tons of weight. I'm not sure what difference a 2 ton jack would make. The wood is holding up very well. I used the press for drying tree fern fronds and some of the stipe pieces were about 2-1/2 inches thick to begin with and ended up being about 1 inch thick and very very hard. My husband, a big guy, helped me with the jack then and I had to stop him from lifting the jack too much because the stipes were being crushed and damaged. Other than the different types of ink printing and pressing plants, it can be adapted to press foods (coconut for haupia, guava for jam, molds (I was thinking of making ceramic tiles, but might make a different type of machine for that). What else did you have in mind? I would be very interested. After studying your press, I could not find springs or counter balance to lift platen. The springs should be a little stronger than weight of platen. You could use more than 1 screen door spring on each side. I think you are right raising platen each time would be energy consuming. The weight of the platen, about 125 lbs. I would guess, would be what you are lifting each time? I'm not sure I understand. Actually, when I say "lift", I mean that cylindrical part of the jack is cranking up and the jack's expansion against the Top Bar. The platen is heavy but not too heavy to manage by myself. I have a little (approximately 12"x12"x12") threaded screw type of press but I didn't think it would have sufficient pressure for engravings and etchings but I really never tried. I like the way they looked. Old Printer? got to get going again! Thank you for your comments.